The Faroese inspired Muir is progressing, albeit slowly. There are other projects going on, and I promise to let you all know as soon as I can what they are! I am very very excited. :) But of course, all of the other fun goings on are taking attention! And time. Lots of time. Here we are after a repeat and a half. You can see that the leaves are growing out of the center panel in a more aesthetically pleasing way! And here you can see a little closer. I am liking this version way better! The frogging was a Good Thing. 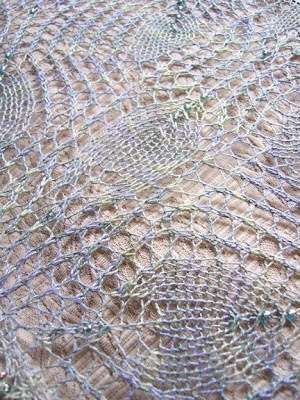 And as those of you who have knit my lace designs know, I love those picot edges! Just a little bit of an ornament, but not too much. Not as plain as straight garter stitch, but so much simpler than a lace edging. I love the beads in the picot. I used this method on Ice Queen, as well, and really like the weight it adds to the edges. It adds a wonderful drape! I don't have much of an update on the mittens: just a couple more rows. So no pics! My progress is a bit like watching paint dry. And, of course, the stealth projects are, well, stealthy. That is absolutely gorgeous. 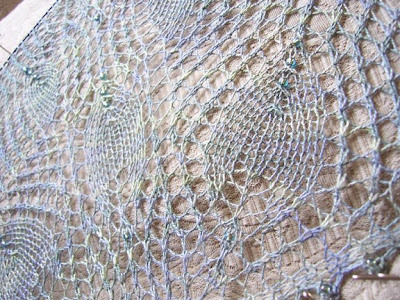 A few months ago, I bought some lovely oops-I-drooled-on-it purple bamboo Habu for the purpose of making Muir, and I think I will have to find some beads and wait for this pattern instead! Very beautiful - I'm following this! Your patterns are fabulous. It's all so very, very pretty Rosemary! You go girl! This shawl will be gorgeous. I love everything about it. To date I haven't tried knitting with beads. 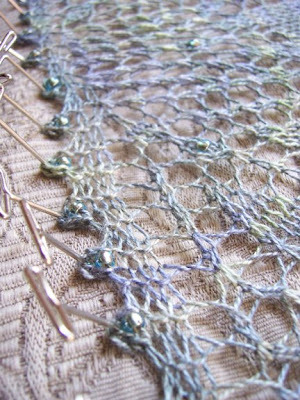 I'd like to use the hook technique, but so far don't know where to get small hooks like that. I like all your desings, and still haven't knit any of it, I already feel I'm missing out, but the right time will come. 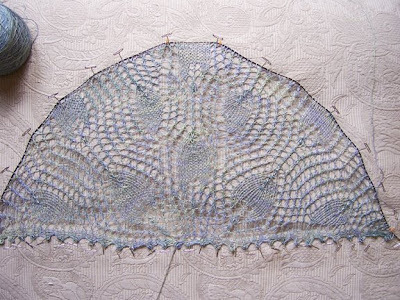 Ooooh - it's looking great and I love the picot edges. Oooh, pretty! Love the picot edge. Oh, that is GORGEOUS. 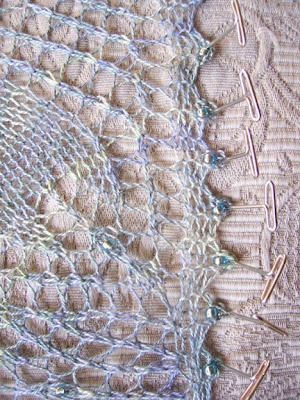 I know what you mean, though; I love lace but it is sooooo slow. I'm loving the way the colours are knitting up ... this is going to be gorgeous. I love the Faroese shape, but so often find the designs are quite geometric rather than flowing, which is my preference. I can't wait to see this one finish - it looks like a must knit to me. You have me inspired to get out the dyepots! That is going to be a beautiful, beautiful shawl. love the yarn and the pattern - what yarn are you using? I remember you mentioning being inspired by the woods, and thus the leaf motif, but I was wondering about the structure - it looks so much like Hawaiian quilting (where they echo the pattern outline over and over outwards from the motif) - did you draw some inspiration from that? Miss Knotty, who loves your pattern, but hasn't knit it yet, but only out of obligation to knit other things first. Stupid obligations. This is looking lovely Romi! That is going to be gorgeous!!!!! I love your Muir Faroese Version, I will be interested by the pattern when completed. It's more beautiful than the stole. It's looking great so far ! Keep on knitting !